A question I received: Kabbalah says that people should not practice mysticism, but should treat everything taking place from a realistic standpoint. On the other hand, the method of Kabbalah is based on “miracles” from Above – things that are incomprehensible and irrational, as you have explained. How do these two things mesh together? My Answer: We are situated in one part of nature – the material part, which is severed from the other part of nature – the spiritual part. It takes efforts to unite with the spiritual part, but if we make them, we will make a “discovery” of the unity that is there. This resembles a miracle because we do not see the connection between our efforts and the spiritual revelation. If we knew what this connection is, we would clearly understand how many efforts we have to make in order to acquire what we want. However, this connection seems not to exist, because we exist inside the quality of reception, egoism, and we don’t feel the quality of bestowal in this state. We are cut off from spirituality and we don’t aspire to it at all. We imagine spirituality in the form of a profit or a great find rather than the quality of bestowal. However, even this kind of incentive is able to gradually draw the Light that Reforms upon us. As a result, we begin to have a greater desire for the spiritual quality of bestowal. A question I received: Why does a person have to go through so many breakings? There’s the sin of Adam HaRishon, the intoxication of Noah, the animosity between Cain and Abel, the destruction of the Temple, and others. Why couldn’t we just go through the breaking once and then proceed to correct everything? My Answer: The breaking is necessary in order for our desire to receive to become aware of itself, to feel that it is on the receiving end and someone gives to it, that someone wants to give to it and waits for a special reaction in return. This is all done in order for creation to learn not only to receive, but also to become similar to the Giver. Creation has to understand that reception and bestowal are just a means for connecting the Creator with creation. It is a means to bring creation to bestowal, to similarity with the Creator, and to help it ascend to His level. When the egoistic desire begins to understand and feel all of this, it becomes “human.” Reception and bestowal are just auxiliary actions that help to elevate a person to the Creator’s level. All of the breakings are done in order to develop us and bring us to this level. All the states, feelings and realizations we go through are necessary; without them we would be unable to attain the Final Correction. We cannot get there in one leap because wisdom comes with experience. We have to go through many states and compare them; we have to experience many inner conflicts and struggles in order to understand them. Our task is not to research the desire to enjoy that’s in us, but rather, through its reactions we study the Light, the Creator. We do not feel the Light itself; we are unable to perceive and understand it. However, by going through different layers of the desire to enjoy, the broken or uncorrected states, by being emptied of Light and filled by it, we study what happens outside our egoistic desire. We don’t know what is really happening “outside.” We only feel the changes happening inside us and we compare them. This is how we study the third component – the Light. Even though we don’t know anything about the Light and we can’t feel it, we are nevertheless able to attain it through its actions. But this cannot be done all at once. The more complex one’s desire becomes, the more contradictions and “shades” it contains, and the greater one’s ability to recognize the Light and the Creator. Therefore, we shouldn’t think that someone is deliberately placing obstacles on our path. The nature of our egoistic desire, which is opposite to the Light, requires it to perform these many actions in order to understand what the Light is, which is so far removed from it. A question I received: I find it difficult to concentrate at The Zohar lessons which is why I try to think about the connection between everyone studying. Is this the right thing to do, or should I make more mental efforts to understand what is being said? My Answer: The efforts have to be made in your feelings, not the mind. You have to feel everything that The Zohar describes, rather than understand it. The Book of Zohar speaks to our feelings, not to our mind. When I read some word such as “Grapes, a tree, heaven, hell,” I should try to find it inside me. After all, I am entirely composed of desire, and desire is sensation, not reason. If I use my mind to transpose all of this into concepts, such as notions of the Light, the vessel (Kli) and the combinations between them, then I will never go beyond the mechanical picture, like a chart, and I won’t be able to come closer to feeling it. The picture must gradually be pieced together inside me in the form of feelings. It is comprised of sensations. I have to accumulate inner sensations and impressions that will gradually come together of their own accord, forming the sensation of the Upper World. It’s the same as how we develop in our world: the mind comes after the sensation. At first a child feels whether something is good or bad, and later he gains the understanding of what he should come close to or move away from. Later on he acquires a broader mind. Therefore, when reading The Book of Zohar, we must always try to identify our sensations and discern what our will to enjoy feels. Later on a mind will emerge within us and begin connecting them into a unified picture. It’s easier for beginners to perceive these processes schematically, but nevertheless, we should try to transfer the text of The Zohar into sensations of bestowal and reception. The spiritual world is a world of forces that act according to laws that we partially understand, while some aspects remain unknown – just like mainstream sciences that explore the nature of this world. We understand parts of the spiritual world, while other parts remain hidden. We have to exercise a strictly scientific and sober approach to spiritual research, just like we do when studying physical nature. What’s concealed today will reveal itself tomorrow. The science of Kabbalah provides us with research tools (Kelim), which can be likened to a microscope within us that we can use to see spiritual forces, the forces of bestowal. However, we have to possess the power of bestowal in order to measure these forces, to see and discern them. A human being interprets all the knowledge and experiences he receives through himself. In any science we always serve as an instrument since we are the ones who ultimately receive knowledge, and to a certain extent we do so subjectively. When we study the science of Kabbalah, we do so consciously and we ourselves become an instrument of research. However, the research itself must be purely scientific. Our research becomes objective because it is in our nature to strive towards objectivity. There are only two forces (properties) in the whole universe: the Light (property of bestowal) and the desire to be pleased (property of receiving) that it created. Everything else follows from these properties. The same applies in mathematics: we have a zero, and a value other than zero. Everything else follows from those values and is simply a matter of calculation. Physics is also the same: there are two forces which are different from one another. This applies to the Upper Light as well. The moment a point that is a little darker than the Light appears, we have two different properties. That is when progress begins and the science of Kabbalah emerges. 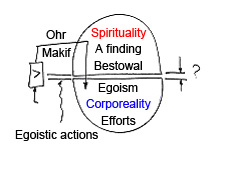 As with any other science, Kabbalah studies discrepancies between two forces (phenomena). This becomes possible by enhancing the differences between them with the help of a microscope (analysis), or by finding points of connection (synthesis). Contemplating only one force is wrong and won’t lead to scientific conclusions, but rather brings up deliberations about an abstract form. When I say, “The property of bestowal,” what do I mean? What is it? Who does it give to? Who does it influence? Where do signs of it show up? How do I know that it is bestowal? The answers is: by understanding the opposite. You can tell the difference only by comparing opposites – by studying someone who is receiving. We cannot simply say that something is positive, because in relation to what is it positive? Where is the negative? In other words, you cannot discern something on its own – you can do so only in relation to something else. The foundation of any science lies in comparisons. There is nothing in the universe except two forces. This approach is strictly observed in the science of Kabbalah. If you distance yourself from matter and the form that defines matter, it becomes mysticism. The Maccabean war and the holiday of Hanukkah were not accidental events in history. This is a story about how a person builds his soul and ignites the Light within it, which is symbolized by the sacred pitcher of oil that we find inside ourselves, in the middle of the whole breaking. There is a part inside us that we can ignite if only we find it! When it ignites, we will correct our egoism in a specific measure. We will thereby receive an opportunity to prepare the sacred oil, which means that we will be able to correct Malchut on our own. The sacred, holy oil is the desire to bestow and love without any reward for oneself. The oil is the desire. Regular oil is the egoistic desires, whereas sacred oil is the desires with the intention to bestow. The spark we receive in order to begin our inner work is like a small candle which each person needs to seek out in himself. When we are able to light this spark, we will begin correcting our main egoistic desire, or preparing the oil for the lamp. “Hanukkah” comes from the words “Hanu Ko,” which means “they stopped here.” This is just a brief stop in the middle of the path, between the inner states called Yom Kippur and Rosh Hashanah, at the beginning of the path, and Purim – the Final Correction. During Hanukkah we correct only the bestowing Kelim as we light a candle above our desire to enjoy. However, when we reach the holiday of Purim, we use the desire itself. Therefore, the symbol of the holiday of Purim is not a candle that burns above the oil (desire), but wine, the Light that fills the desire. In order to light a candle, we have to unite Malchut and Bina, the desires of reception and the desires of bestowal, in order to light it in Bina. This is the meaning of the holiday of Hanukkah, when we raise Malchut to Bina, and Malchut thereby becomes a part of Bina, adding the force of its desire to it. Then the Light ignites in Bina, in the wick, which rises from the oil. The wick is Zeir Anpin, which is called the middle line. It connects the oil, Malchut, with the Light, Bina. All of this occurs above our desire. This is a correction where we attain the quality of bestowal, receiving it above our egoistic qualities. We achieve the state called Tshuva mi Ira – bestowal for the sake of bestowal. If the lower one cannot receive anything, the Upper One restricts Himself. The Parsa is a very special place where the restriction of the Upper One occurs. It causes a great difference between what is above the Parsa – the World of Atzilut, where the Light can be disseminated, where Bina – bestowal dominates; and what is below the Parsa – the Worlds of Beria, Yetzira, and Assiya, where Malchut, the desire to receive, dominates. One unified structure is thereby separated into two parts that are opposite to each other. The upper one is governed by the Creator and the lower one is governed by the created being. This is the first step towards creating a connection between the created being and the Creator. Until this occurred, the created being did only what the Light ordered it to do. The Light canceled me out and I was only able to give because it ruled over me. However, now there are two kingdoms in me and they are absolutely opposite to each other. They are the kingdom of Light and my kingdom, where I am the ruler. The Light left me, and I performed a restriction on my desire. However, then, in this empty place of restriction, new desires come: egoistic desires, Klipa. And then we are separated like two opposite worlds! Above the Parsa, in the World of Atzilut (where “Etzlo” means “He has”) there is complete correction, infinite Light. And below the Parsa, everything is the opposite: a shattering, evil, and every offense imaginable. Hence, He and I become clearly opposite to each other and begin to hate each other. We become distant, even though we are separated only by a very narrow division, the middle third of Tifferet, Klipat Noga, where my whole freedom of will is concentrated. On one side, there is the Creator, the Upper Sanctity, and on the other side, below, beneath the Parsa, there is the corrupted created being, the ego, and filth – and I am an intermediary between them, in the middle. My whole existence, my “I,” lies in this narrow strip. I was given an opportunity to wedge myself into a narrow corridor between these two huge armies: the force of reception and the force of bestowal, in order to become an intermediary between them, bring them to a compromise, and then to connection and love. By uniting them into one, I build myself consisting of both of them. The Creator created the desire to enjoy, and nothing was created besides this desire. A greater desire for pleasure dominates over a smaller desire. Thought or the mind helps us go from one desire to another, from one state to another, from a particular type of desire to another type. Desires are the matter of nature. Meanwhile, a thought is the means, the instrument that helps us use the desires, to shift around within the force field of these desires – from a greater force of desire to a smaller one, or the other way around, as though coming closer to a magnet or drawing further away from it. A thought is the force of movement between desires. It enables me to change my placement among different desires, shifting between them. However, no matter what desire I am in, it still dominates me. Therefore, I need to use the power of thought to help me understand and convince myself that my desire, my state, and the circumstances I am in are bad. There are better circumstances, but to get there I have to change my desire with the help of the thoughts. I have to transfer myself from one wave of the force field of these desires (the intensity of the field) to another wave (intensity), like a charge in a magnetic field. In the science of Kabbalah, the thought’s analysis of the desire, which I am in, is called a realization of evil. The development of the thought in me occurs under the influence of the environment or under the influence of the Upper Light. In this manner, we can “flow” through the field of desires, shifting between them, from a lower desire to a higher desire. The thought (realization of evil) helps us go from one state or desire to another. Hence, the mind and the feelings work in us interchangeably. However, we always move according to one scheme: desire – thought – desire. Each person contains the entire world; The Book of Zohar lets us reveal it within. Malchut cannot receive the quality of bestowal from Keter, which is all Light, but from Bina – the desire that is filled with bestowal. The Upper Degree is myself that doesn’t exist yet; it is myself + 1. The best means of spiritual advancement is to disseminate Kabbalistic knowledge. By doing so, we are sure to realize the Creator’s desire. The Creator wants all his creations to unite as one in order to come into adhesion with Him. A common desire, which has been split, broken, scattered, and crushed into billions of parts needs to join together above this separation, once more become whole, and unite with the Creator. This constitutes the goal of creation and the Creator’s desire. If our actions are aimed in the direction of connection, and if we disseminate the science of Kabbalah as the only means that leads to this goal, we thereby draw the Surrounding Light upon ourselves. This Light which we receive when we move towards connection is several times more powerful than that which we would have received on our own. Knowing about this wonderful opportunity, we summon people to disseminate. If every person participates in this action, the force of the Light that we draw will be multiplied by many times and will benefit us all. A question I received: How can a person ask for bestowal if he does not know what it is? My Answer: Spiritual growth is like the development of a child, for whom it is not enough to be just a passive participant in the process. This is natural development where a child reveals the world for himself in a natural way. He needs to taste it, hold it in his hands, recognize it, put it together, and break everything. He himself doesn’t know what he is doing since he is operated by nature. Later, having experienced everything, a child begins to think about and build connections between things; he begins to understand and demand. This is very much like we act in regards to our spiritual development. No matter how smart we think we are, and no matter how many serious subjects we discuss, this is not what causes us to develop. Just like little children, we bring the force of development onto ourselves, which is the same force that develops a child. Therefore, a person needs to reach a demand for bestowal on his own. There is no button you can press and immediately be allowed into the Upper World. If a demand, an aspiration is burning in you, you express it involuntarily within yourself. A “prayer” is work in the heart and is the innermost desire of the heart, which you may not even suspect exists. After all, is it possible to compel yourself to pray? You can’t oblige the heart. Therefore, we need this force which develops in the material and the spiritual worlds and which constantly changes our desires. The Light created these desires, and it also reveals and transforms them through its influence. Therefore, our goal is to draw the Light onto ourselves with the help of books and our studies. It is in our power to evoke a response, to turn to the source of Light in order for It to cause a faster development. This is the only means by which we can speed up this process. Nature develops us according to a designated program, in planned time frames; however, starting from this particular stage in human history, it has become possible to speed up the process. Today we are able to activate the force of correction so that it influences us even more intensely. The science of Kabbalah is in fact that tool, that vehicle that allows us to achieve a shortened period of development. The point is not in gaining more understanding. It is enough to “wave your arms and legs,” like a restless child, within the bounds of the Kabbalistic method – in lessons and dissemination. In other words, we must become animated and engaged in the process of our development. We intensify the Light by trying to aspire to It, rather than through our business-like manner and thoughtfulness. Whether a person is smart, phlegmatic, or sensitive is irrelevant. In the long run, whoever behaves in a more active, engaging manner will advance more rapidly.